Notes: Things are picking up a little! While still trailing last year’s totals by quite a bit, the birds are definitely starting to fly south, with clusters of White-throated Sparrows, Nashville and Magnolia Warblers zipping around our bushes and shrubs. Evidence to this effect: this week we observed and banded our first Ruby-crowned Kinglets and Slate-coloured Juncos for the season - the kinglets right on schedule compared to last year, but the junco a full three weeks earlier than in 2006. 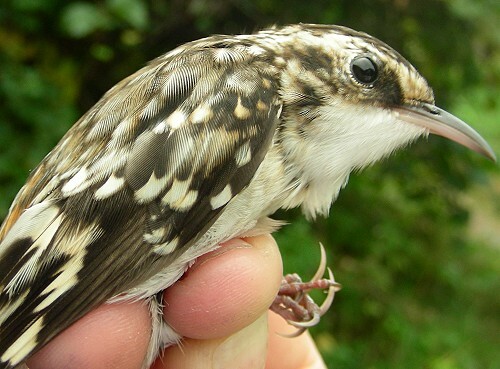 Other new observed/banded species for this week include Merlin (observed) and Brown Creeper (banded). 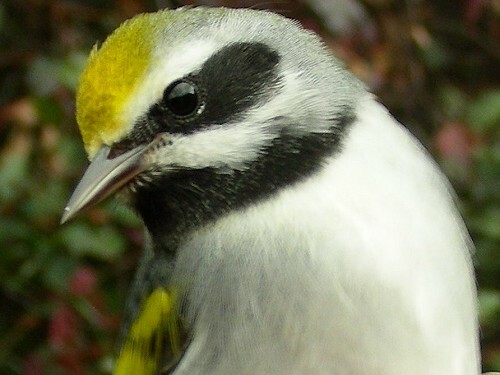 Eclipsing all our new entries for the season though, is the exciting banding of a young male Golden-winged Warbler! We first observed a male Golden-winged during our initial season in fall 2004, high up in the canopy along the census trail, but haven't even observed another since, so to be able to band one was quite unexpected! Needless to say we were quite excited about it. It’s funny how one season sets you up with expectations for the current season. Last year we were absolutely inundated with Common Grackles at this point. So, naturally, we’ve been waiting with bated breath for the clouds of grackles to descend upon us…. to no avail. We’ve not seen nearly as many grackles this week as last year at this time. Whether this is another sign that migration is delayed this year, or whether they’re congregating somewhere else, we don’t know. We’re hoping that they’ll still drop by because despite their rather aggressive nature in the nets, we still love them! The top 10 species banded this week has changed significantly since last week, with Magnolia Warbler tumbling from top spot to near the bottom, and half the list comprised of species that didn't make it on at all in week 5. White-throated Sparrows now dominate the list, followed closely by the American Goldfinch. 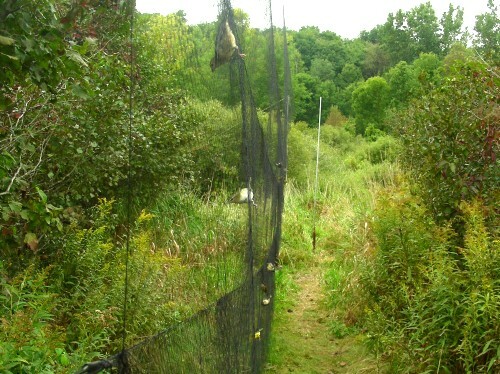 It’s not that we’ve been banding tons of goldfinches all week long – 18 of them arrived all at once in H1 during the closing round on Tuesday, making for a bird-filled net (see below). Luckily we had our camera handy! Now is still the ‘time of the warbler’ though, with half of the top 10 of the warblery persuasion, and the shrubs around the site (when not being blown around by gale-force winds) usually dripping with warblers if you watch closely enough. Of note, we've banded almost as many Wilson's Warblers in the past two weeks as we did during the entire fall season last year. We’re hoping for overcast skies and no wind for next week, so that we can band as many of the warblers as possible while they’re still around. The top 10 observed list is again topped by our usual four suspects. The changes come in further down the list, with Canada Goose, White-throated Sparrow, and yes, even the European Starling making their first appearances of the season. Those of you familiar with the avifauna of our site should be somewhat surprised with the starling’s appearing on the list (even in 10th position), as we only rarely see them at MBO. Truth be told, they appeared only twice last week, but in sufficient number to warrant including them in the table. The same is true of the Canada Goose, though we know their numbers will swell as the fall progresses. Likewise, white-throats are steadily increasing in number and are sure to be included in the top 10 lists for weeks to come. On the other hand, the Song Sparrow is getting scarcer by the week, though past seasons suggest that at least some will stick around MBO until close to the end of the fall season.